The Skirted Roundtable: Bobby McAlpine!!!! Need We Say More? Bobby McAlpine!!!! Need We Say More? He came, he talked, he conquered. The buzz about our latest visitor was loud. It seemed everyone was as excited as us to hear what Bobby McAlpine had to say. And he had a lot to say. We talked for over an hour and 1/2, but of course, Linda had to edit it down somewhat. He's a true Southern Gentleman - soft spoken and polite with a slow drawl AND a little bit of a potty mouth!!! His IQ must be in the stratosphere. He is VERY cerebral. And he is very nice. He talked about his new book - THE HOME WITHIN US. He talked about this house he lived in for years - the one on the cover of the book and above. We talked about how well written his book is - it's not just a bunch of pretty pictures, though there are tons of those too. He talked about how he completely redid this house several times. He talked about who lives in it now. He talked about what he prefers to do - architecture or interior designing, because he excels at both descriptions. He talked about this major project - adding a dining hall onto a large house. Here is a picture of his solution to that dilemma. 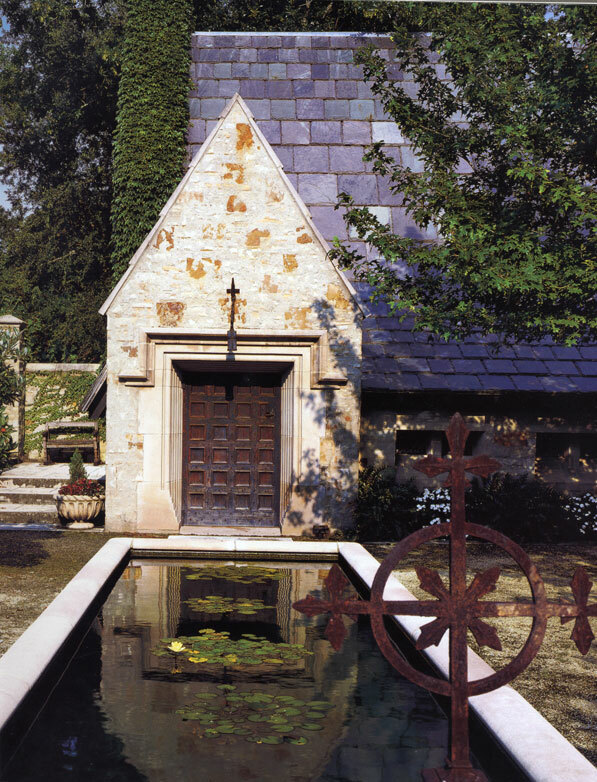 He talked a lot about this house and its owners and the chapel he built for them. Here's what that dining room addition looks like inside. We want to extend a huge thank you to Bobby for joining us on The Skirted Roundtable. It was a thrill, it was humbling, it was a dream. It's not every day you get to talk to one of the best architects America has. And - another huge thank you to Bobby for offering his book THE HOME WITHIN US for a giveway. Be sure to enter by leaving us a comment with your name and email address. To order this wonderfuly well written book with its gorgeous photographs - go HERE. And as always, we appreciate your continued support. Perfect. That is all I can say about Bobby McALpine. He has done so much for Montgomery, ALbama and so many others! Talented doesn't do this great interior designer justice. LOVE this post. Just about to listen to the SR - would love to enter the giveaway, have not bought the book (yet...). Browsed through it at my architect's office, and looks wonderful! That dining room is heavenly! I can only imagine enjoying the changing seasons while sharing it with friends--I'd go broke just throwing dinner parties! Gorgeous! Great to hear another master talking in depth about his life and career. I love hearing the design perspective of those I admire...thank you for sharing another great interview! Can't wait to listen. Have heard every SR so far but was away from the computer the last two weeks and so delighted to come back and find new SR's!! That was a fun listen - he is charming but cheeky at the same time! Waving my currently broken hand in the air to be in the draw for the book. Reading, podcasts and blogs are the only things keeping me from going completely bonkers at the moment! Thanks so much to Mr.McAlpine and the GSO's. Working fast at the first client meeting rings true from a what a classmate of Mr.McAlpine told me about doing renderings. Paraphrasing: "Whatever project we did, Bobby could whip out something at the last minute that was way better than everybody else's no matter how much work we put into it. "Everything that becomes mature and becomes heritable is subtle ... it takes a real strong and smart appetite to try to develop what's going to last." "American is a dream sewn up in cotton, it's not silk or wool or stone or anything else. It's sewn in a common material that is provincial and it's lovely because it's so pure of heart. Maybe a little lacking of resource, maybe a little lacking of background, or credential, or bloodline or whatever. But there is something lovely about it ... it's loveliest architecture shows up through the naivety of it's natives." "It's ironic ... humble is always the most expensive thing you can do." "As an architect I would chose the space first ... really really right ... gorgeous ... poetry ... something heart-full (heartfelt?) to it ..."
"If I can't(get the right space) ... I would certainly decorate the #@! !% out of something that wasn't right..."
"No ... I love sequence; I love for things to unfold..."
"The minute you crack open the container (meaning the house) I want you to be destroyed ... disheveled by the level of intimacy, what's being offered you has got to bring you to your knees. It's not to impress you; it is to tell you how badly wanted you are and how long we've been waiting for you." "Lutyens ... mine is so much better." Bobby comes across as a profound thinker, an intelligent dreamer, truthful, and delightfully down to earth. I loved the richness of his language and the way he uses the language in original ways (like a author of literature would), ex. being "destroyed" by design. I really like how Bobby wanted to be pushed in the conversation. So refreshing! Thanks for setting Bobby a place at your table. I know he had a blast and we appreciate the audience. He is just absolutely brilliant. Thanks for a great interview! I have been to parties at this estate. The dining room extension is INDEED heavenly. The chapel is brilliant too! FANTASTIC! How could I not comment for a chance to win this book!?!!? It's been on my to buy list for weeks now!! Fingers crossed, off to re-listen to the interview! Isn't it wonderful how our childhood shapes our futures, sometimes? Love his approach: "It's always interiors first!" YAY! How interesting to consider that the 'Villa' within John Saladino is an inspiration to 'The Home Within' Bobby McAlpine! I'd love to win the giveaway for a copy of McAlpine's book! It has already been said, but certainly should be repeated . . . brilliant! I learned so much - thank you to Bobby and the SRT for another great interview. Wow, that guy can talk some heart felt feelings. I was hanging on to every word. Great interview! Keep it up Ladies. Hope to win. Brillant and definetly potty mouth! What a beautiful book and I love his comments. Your blog is a great resource for the design community. an inspiration to all design professionals! I never get tired of looking at his work. It is incredible. Thanks for the article. I haven't listened to the interview yet, but want to enter to win that luscious book right now! EYE CANDY!!!! WOULD LOVE TO WIN! I LOVED this interview. Thank you so much for posting it. Really rich, thoughtful and thought-provoking. I'm getting the book from the library! What an inspiration Bobby is! Love the fact that he's had so much success especially being from a small southern town and not the so called design meccas...proves that real talent, hard work, and love of what you do pays off....I just wish we could see the other 500 projects he's done. Thanks so much for bringing Bobby McAlpine to the table. And I left out...it probably helps to be a genius! Thanks so much for this interview. Even though I've read his book, I'm always greedy for more detail and insight. He is so right to influence the interior space too. Amazing book! Would love to read it and show the photos to my boyfriend. Best wishes from Ane, Norway. You know...It was like reading a great modern poem. Such deep and real beauty in his words. I really enjoyed this peek into the soul of his brain!Refreshing! I wanna hear the other half hour! My daughter is an aspiring architect and interior designer and would be very interested in his book. I'm definitely going to get it for her. love him. and his filthy mouth! too precious otherwise! just bought the book and can't wait to listen!! so excited!!! What a fun and refreshing conversation. Love his passion that really comes through in this discussion. Now I'm dying to get my hands on his book! I sooo enjoyed listening to this interview - Bobby's comments were intelligent and inspiring and he has such a refreshing take on design. Genius! There is a McAlpine home in my neighborhood. The home is lovely. Somehow the inclination for arrogance which follows McAlpine is seen as humility here. I think this is a consequence of our living with a pop culture mentality. The architect/philosopher/artist/smoozer is one hard act to follow. Love your website! I also love Bobby McAlpine. For years, I have been admiring the projects that he has had published in the various shelter magazines. I think he is an amazing architect and designer and would love to win his book. Thanks so much for the chance! Could there have been more preening here - I doubt it. Makes me long for Charlotte Moss. Ladies you "cracked open" the container and a little genie with an ego of epic proportion jumped out. McAlpine demands a lot from his clients. He is ferried about in celebrity fashion and by the time the project is finished, he thinks the client works for him. It's sad to see the someone of talent become such a preening peacock. Great interview. I listened to it twice. Thanks so much! Non Americans like myself love listening to a Southern accent. It's like syrup, I could listen to him for hours. I notice Joni turned up her own Southern accent to match his!! More please. Be sure to check out Bobby McAlpine Home/MacRae for the Oak Leaf Wing Chair. I wonder what the inspiration was for this design. Was it Robin Hood and his merry men or a knock off of a chair from the Alabama State prison. It would definitely have been worth a conversation with Bobby to find out. Fascinating interview. I listened twice and understood and enjoyed it much more the second time around. I appreciate Mr. McAlpine's honesty...so refreshing. I'm thankful there is someone out there designing/crafting real homes...the inheritable kind. I love everything he does! Such a talented person! OMG! I LOVE THIS MAN...I was sad when this interview was over!!! Potty mouth and all! What an amazingly talented man. We Southerners are so proud to call him one of our own. Most importantly, the combination of aesthetics and truly living are blended beautifully. Bobby, you make us look so good! I truly enjoyed the interview. Was a little puzzled as to why no one mentioned the thatched roofs that are all over Carmel, California. The town is famous for them! the pics of that gorgeous house has left me breathless! MY dream man... would love to have the book! This was a very interesting interview! I really enjoyed it! To me Bobby is really inspired by European architecture : tatched roofs,steel windows. He is unbelievable talented and besides he is a very warm person. I loved hearing his voice! There is a picture of the crazy interesting 'christmas tree shoppe' which Linda mentions on my blog at this link here. I cannot believe it's taken me this long to listen to this, considering your guest is one of my favorite architects/designers! I was privileged to attend the same high school as Bobby, and it is forever my regret that I did not know him well back then. I guess I was busy "looking in" as well. I heard him speak at Nashville's Antique & Garden show a few years ago, and was captivated. This interview was icing on an already deliciously rich cake! Thank you so much! I cannot agree more - steel windows look so classy that it's impossible not to fall in love with them. And the pricing... well, at least it's for sure that they'll last for a lifetime.